Back off, night ghasts! Your mascara is running. I clarify: I don't have any problem with the choice to dial back the production to something more primal and pissed off, on the contrary that is what I expect from a lot of the Finnish black metal I encounter. If the music here was sufficiently memorable or engaging, this aesthetic might even serve to enhance is value. The blast beats here are so uniform and splashy that they seem to fade into nothingness when you concentrate on the streams of chords. Mid-paced late 80s Bathory-like charge riffs erupt through the hyper-maelstrom at steady enough intervals that the record isn't monotonous, and yet a lot of the blasts really translate into a sense of sameness that renders them indistinct. Guitars are performed with a lot of ferocity and passion, no doubt, but I found the majority of the tremolo progressions here a little bland and lacking those surprisingly warmer textures Let the Devil In celebrated. There's a real lack of depth in service to a presumed aura of 'emptiness', but when you break them down they just sound indistinct from so much of the Scandinavian extremity we've previously encountered. Bass lines might not have been of tantamount importance on that album, and here they offer a comparable presence, hovering in the low end but rarely breaking from the guitar notes. The biggest difference, though, is arguably the vocals, which are part the black metal status quo and then part more ominous guttural...only you really need that, because when he's rasping along I also struggled to hear him against the guitars and beats. 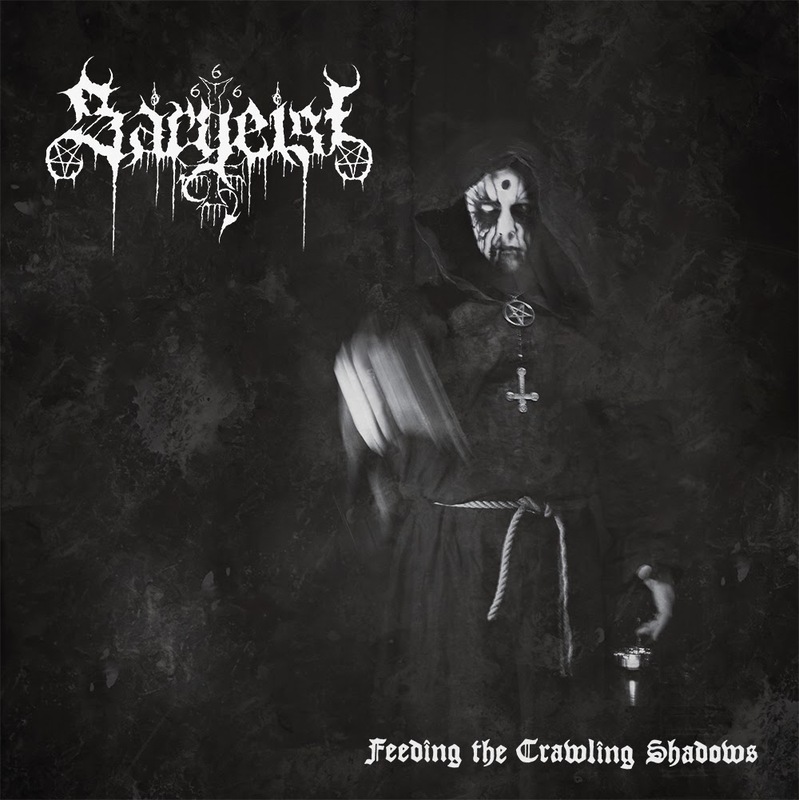 That rotten, romantic desperation infused in the last album survives here, but it's repressed quite like the older Sargeist demos and full-lengths, and this is simply more orthodox and presumably 'evil', or it would be if the actual composition of the notes felt more sinister in structure. As it stands, a handful of the tracks like "Inside the Demon's Maze" have a few haunting moments, but overall Feeding the Crawling Shadows just blurs against Shatraug's sum body of work. It's certainly not lazy or arbitrary, nor would his aesthetic decisions lack poignancy through stronger songwriting, but the riffs just aren't as great as what he's put out before, and the guy could probably put out a half dozen records of this quality in a week. I'm not advocating that he's run out of steam, or that his proliferation hasn't produced a number of surprise gems, but there's an unwillingness to refine or grow his formula, which puts all the more pressure on having songs that rule. Of course, those who were seeking a retrogression towards the primeval epoch of Horna, Behexen and this project itself will enjoy (or not enjoy) this on principle, as would anyone seeking records in the blueprint of Darkthrone's Transilvanian Hunger or Mayhem's De Mysteriis dom Sathanas (if rendered even icier and more hostile), but as true to its roots as Feeding... is, its impact is too fleeting, and I struggled to remember it in the hours between listens. One of the blackest of the black metal albums I've heard this year, indeed, but that unfortunately doesn't warrant further compulsion in this case.